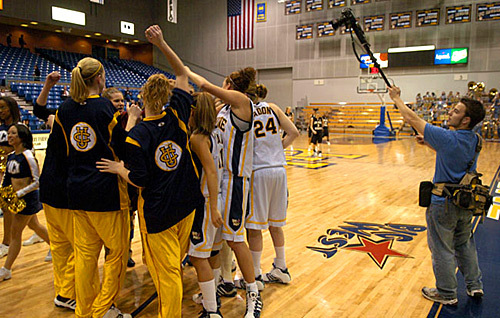 Chris Detrick works his pole-cam at the UC Irvine vs. Long Beach State women's basketbal game on Thursday night. Editors note: Max Morse and 38 other SportsShooter.com members have decended upon Buena Park, California this week for the 2005 Sports Shooter Academy. There are 30 SportsShooter.com members participating as students and nine SportsShooter.com members working as faculty and staff, including program director Robert Hanashiro. The 2005 Sports Shooter Academy, sponsored by Nikon, got under way got under way on Wednesday in Orange County, California. With 30 SportsShooter.com members attending as students, as well as nine SportsShooter.com members on staff, the weekend is set to be an incredible celebration of sports photography. Participants have come to Orange County from such faraway states as Missouri, Iowa, Hawaii, Ohio, Michigan and Kentucky to name a few. Andrew Malana wins the award for most miles traveled to attend the Academy as he made his way to the O.C. all the way from Tokyo! After a pair of inspirational presentations by Donald Miralle and Matt Brown on Wednesday night, Dave Black wowed the students with his fantastic work on Thursday morning. In the afternoon and evening, students got their choice of three different Big West basketball games. Unfortunately, both baseball and tennis were not shot due to rain. Program director Robert Hanashiro was very excited after the presentations on Wednesday night. "The group of photographers and students that registered for the Academy are so enthusiastic and excited, you can literally feel it in the air in our meeting room here at the Holiday Inn Buena Park," Hanashiro said. 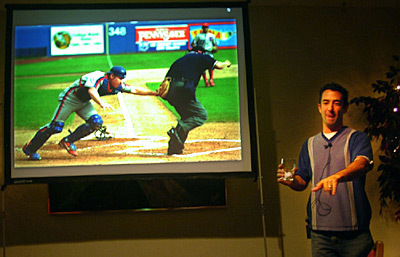 Matt Brown speaks on Wednesday night. Students at the UC Irvine basketball game were forced to think on their toes, when it was discovered at the lighting setup that there was not enough power to run all the strobe packs. After a number of different power configurations, the strobes were finally working (for a while, anyway) thanks to the help of Academy student James Rulison, faculty member Darrell Miho and staffer Jeff Bottari. "Setting up remote cameras for the first time was a little tough, but the help from Donald Miralle and Wally Skalij was what made the difference for me today," said Academy student Sara Wolfram after shooting the UC Irvine vs. Long Beach State men's basketball game on Thursday night. Academy student Scott Galvin added, "I've used strobes at basketball games once or twice, but I was really excited to learn all about the strobe systems and different remotes. It's not every day that you get to learn from someone who has worked a lot with Sports Illustrated (Darrell Miho)." In the next few days, students are going to get a taste of a whole new host of sports, including horse racing, rugby, volleyball, water polo, and more basketball and baseball. They are also going to get their choice of a number of lighting demos. With late critiques and early wake up calls, it should be a long, fun weekend. So keep your eyes peeled for the names below to be updating their member galleries, and see what is happening this weekend in the Big West. 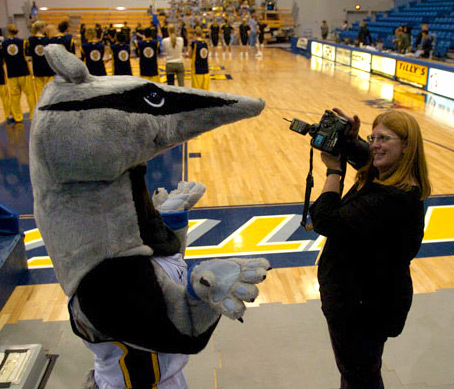 Dianna Russell talks to Peter the Anteater at the UC Irvine vs. Long Beach State women's basketbal game on Thursday night. Everything you could ever want for photos. (go ahead click) ::..